“Conservatives tend to obey” so bad men can do anything they want to them – What's Up With Francis-Church? This latest retelling of the grisly story of St. Luke’s NuChurch re-education gulag for recalcitrant priests is reminding me that we need to talk about something. Let’s talk about the abuse of holy obedience, and how Holy Obedience doesn’t count if we’re talking about spiritual suicide; obeying your superiors right over the cliff to perdition. I’ve said before that the horrors of this pontificate – and the trickle-down effect of creatures like Cupich being made bishops and cardinals – are starting to wake people up, even priests. There’s certainly been enough bad press for a place like St. Luke’s to warn priests who might be ordered there that it’s in their interests to disappear instead of go there voluntarily. But it is still happening. Priests, seminarians and religious are still being manipulated by a false understanding of Holy Obedience. True obedience is obedience to Christ. If your superior wants you to obey him in opposition to Christ, or to the Faith that Christ founded for the salvation of souls, then your obedience is false. But what does all this mean in the larger context. Everyone’s paying attention to the Cardinals n’ Choir Boys show right now, but we have bigger and, frankly, more difficult fish to fillet. Because “abuse of trust” in the context of the Holy Catholic Faith means “abuse of holy obedience.” And that’s how the Church has been infiltrated. That’s how the Church in every institution has come so close to being destroyed. The problem of course, is that without a correct understanding, without the correct balance between holy obedience and a right knowledge and understanding, this is a recipe for brainwashing. Yes, I really mean actual brainwashing. It’s a means of infantilising, rendering a person completely helpless when a real crisis comes. And we may have noticed that we are in a crisis. This external crisis – that we have a manifest heretic, an evil man, on Peter’s throne, and are governed in the main by similar characters, men utterly bent on destroying as many souls as possible – is being enormously exacerbated by the internal crisis of faith this situation presents for the faithful, most of whom emphatically DO NOT have a correct balance between holy obedience and right knowledge. None of these very bad men could function at all if they were not followed by people who refuse, out of a distorted notion of obedience, to face up to the reality. The Devil’s greatest trick was not convincing the world he does not exist; it was convincing good Catholics that they can obey their lawful superiors into sin and heresy, that everything will be fine – they can be heretics – as long as they are practicing holy obedience. There has been a long history, all sorts of historic circumstances, that has brought us to this. A big part of it was the lack of deep formation available to Catholics before Vatican II. A lot more of it was the response of faithful “conservative” Catholics after the Council looking to the bishops, “the Vatican” and the pope for rescue from the chaos of heresy we fell into. A great mythology was built up that “the Vatican will save us,” that as long as there were “good bishops” and a “good pope” out there everything was going the right way. All we had to do was be “the pope’s men” and it would all turn out. This brainwashing is how they destroyed the convents. This is how a small cadre of revolutionaries could get hold of an entire global institution. It’s a damn clever little key that opened every lock we had. What’s the missing factor? What is the one aspect of Holy Obedience that keeps the locks secure? Right knowledge. Essentially, the Holy Catholic Faith in its entirety. 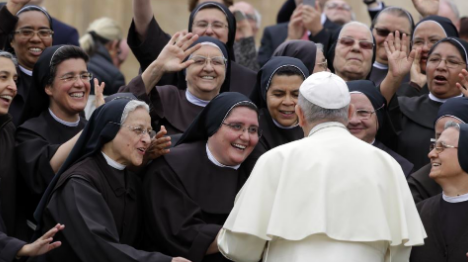 Taking only the example of the nuns, the locks were only broken because of the poor quality of formation – of education in the Faith – of nearly all sisters. Most people in the lead-up to the cataclysm were given no more than simple catechism; a recitation of formulas that left them unable to respond intelligently to the devious manipulations of the Modernists. The Modernist MO is to twist, deconstruct and slyly misdirect through the manipulation of language and definitions. If a Modernist uses terms from Thomas Aquinas, he is using them to mean something Thomas never did. Simply being able to recite the answers in the Baltimore Catechism was never going to be sufficient defence. This weakness of Catholic formation – knowledge of the Faith – was quickly exploited. 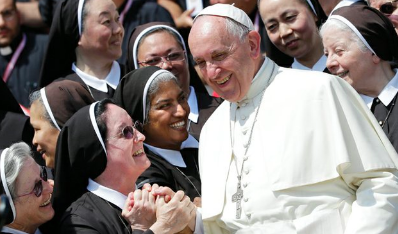 And make no mistake, the targeting of the nuns was a deliberate and calculated assault. Naturally they went after the teaching orders so they could gain access to the entire Catholic world; kids from the earliest ages. But they did it to contemplatives as well. This is how you get entire ancient orders of cloistered nuns turned into – not to put too fine a point on it – idiots; infantilised nitwits, rubes, gullible, credulous fools, who will fawn with breathless, weepy adoration over anything and everything that comes from the Vatican, as though the men there are somehow magically transformed into angels as soon as they’re given a curial sinecure. It’s good to be innocent. But it’s bad to be stupid. Oh yes, they do indeed. Much like a lion loves an antelope. 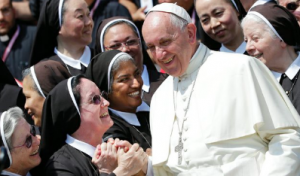 The nuns themselves are responsible for the destruction of the religious life. They gave it away. This is especially true of the “conservatives” whose aim in these times is to demonstrate not their faithfulness to the Catholic religion or to their charisms, or even to Christ, but to the person of the pope, whoever he is, and whatever he wants to do. The papacy has become a cult of a man; a cult of adulation that was started by John Paul II. This pope has been opportunistically using this distortion. It’s dying down among the general public – who have daily access to news and information about the things he’s saying and doing. 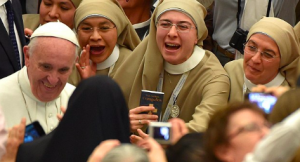 But nuns don’t use a lot of social media, and they read the kinds of institutional periodicals that are only interested in perpetuating the mythology. Pope Francis breaks Catholic traditions whenever he wants because he is ‘free from disordered attachments.’ Our Church has indeed entered a new phase: with the advent of this first Jesuit pope, it is openly ruled by an individual rather than by the authority of Scripture alone or even its own dictates of tradition plus Scripture. … and how many of the sisters, screaming at the sight of this pope like swooning teenagers at a rock concert, would agree. Time to start being grown-ups, ladies.